I was asked to write this article by Stretford-End.com before it was announced that Bryan Robson was battling cancer, as I’ve long made it known to all my fellow Manchester United supporting friends that Bryan Robson is my all time football hero. Ever since I started to follow football as a child in the 1980′s, one player stood out for me – that was Bryan Robson – for his determination, courage, will to win and the fact that he would give his all out on the pitch for club and for country. The result of this, despite some considerable and painful injuries, was that he was to become the best midfielder of his generation and long after he retired, he’d still be remembered for how great a player he really was. Born in 1957 in Chester-le-Street, Bryan Robson and his family were all big football fans – especially of Newcastle United. I remember of a Bryan Robson video documentary I have, where Robson describes his 1st match that he went too – at Roker Park, for a Sunderland vs Manchester United – where he watched the game on his Dad’s shoulders from the terraces. The love of football started early for young Robson, beginning that night at Roker Park. A young Robson joined the Cub Scouts purely for the fact that they had a football team. From there he would go on to represent his school teams and his District teams. Robson attracted interest from a number of clubs, with West Bromwich Albion being the ones to sign him. At the time Robson was a really raw talent and it would take Robson a number of seasons to develop there. His height, built and strength especially being seen as having to be worked on. The arrival of Ron Atkinson at West Brom in 1978 as Manager, coincided with Robson’s form and appearances in the West Brom 1st team improving. The result was a call up to the full England squad in 1980, however he was left out of the England squad for that year’s European Championship finals in Italy. A real disappointment for Robson, but I’m sure that set-back, like the injury problems he’d also suffered at Albion also made him more determined to succeed. The following season, Robson indeed came back stronger, for both West Brom, who finished 4th and for England, who had been calling Robson up on a more regular basis. At the end of that season, following such a great finish in the league by Albion, Ron Atkinson was asked to become the new manager of Manchester United, to replace Dave Sexton. It wouldn’t be long before Robson would join Atkinson at Manchester United. Following Ron Atkinson’s decision to sign Robson for a British record transfer fee of £1.5 Million in September 1981, he famously said about Robson, ‘With this player you’re not taking a gamble, what you’re buying is pure gold’. What Atkinson said that day to the media proved to be the perfect description of what Robson would be to Manchester United over the next 13 years there as a player. Right from the start Robson became a regular in the United 1st team and also for the England team too, where he was to become a key player as they qualified for the 1982 World Cup in Spain. Some players feel the pressure of more responsibility at bigger clubs and on the international level, whilst others flourished – which was what Robson did in 1981-82. After an impressive 1st season at United, Robson would grab further headlines at the World Cup. It was a perfect start for England – in their 1st match, they played France and Robson scored the opening goal after only 27 seconds, which was then the fastest goal scored in a World Cup Finals tournament. England won the game 3-1, with Robson getting another, followed by winning their next 2 matches to top their group. From there it was through to a 2nd Group Stage, in the old style format – where England had 2 frustrating draws against West Germany and Spain, which meant they were out. It was a successful tournament for Robson personally however, and his reward for that record early goal was a specially inscribed gold watch. Typically though when receiving this, Robson as he always did- looked at the role of his team-mates saying ‘How do you split this amongst the England team?’. 1982-83 season would get even better for Robson, who would now be captain of Manchester United and also England under new manager Bobby Robson. The match Robson is best remembered for that season is the 1983 FA Cup Final replay against Brighton – which the club won 4-0 with 2 Robson goals. He was offered the chance of a hat-trick, but selflessly declined and let Arnold Muhren take the penalty instead, as he had been appointed as penalty taker before the match. Again, Robson showed the value of team spirit with that decision, which was recognised by fans watching around the world. It was a great way to finish the season for Robson and United. There had been disappointment finishing 3rd again in the league and also losing the League Cup Final to Liverpool which Robson had missed due to injury, so the FA Cup win was a real encouragement. Season 1983-84 would be another memorable one for Robson and that is especially due to one particular match – Manchester United vs Barcelona in the European Cup Winners’ Cup Quarter Final 2nd Leg at Old Trafford. United had lost the 1st Leg 2-0 in Barcelona, so needed an incredible performance at Old Trafford that night, which was exactly what they got. United won 3-0 against a truly great Barcelona side Captained by Diego Maradona. Robson scored 2 of those goals and put in a truly world class performance – it was one of the greatest European matches and atmospheres ever seen at old Trafford. I still have the video from that match – amazing night led by Robson. I also loved the scenes at the end of the match, when some of our fans ran onto the pitch at the end to celebrate with Robson, then lifted him onto their shoulders and carried him off the pitch – a scene which has been played back many times in club histories and documentaries. Sadly Robson would miss both legs of the Semi-Final against Juventus and United would be knocked out. In the league United finished a distant 4th. Robson’s performances had caught the attention of Juventus though and there were lots of stories going around that he would be sold to them for £3 million. Thankfully he would not be, and he would remain at the club for a long time to come, choosing instead to sign a new long term contract at the club. Season 1984-85 is best remembered for amazing FA Cup performances for both Robson and United, in particular what became known as ‘Scousebusting’. In the Semi-Final they faced biggest rivals Liverpool at Goodison Park. The match was drawn 2-2, with Robson getting one of the goals. The replay at Maine Road was a classic match – United winning 2-1 with Robson getting the winner. At the end of the match lots of United fans invaded the pitch to celebrate with the players. Robson in particular, was mobbed by those fans and was again carried off the pitch by our fans as a true hero, like he was after the Barcelona game a year earlier. The final was won by a Whiteside winner against Everton. A great way to finish the season. United had proved they could beat the other 2 best teams in England at the time, Liverpool and Everton in one off games – the following season was seen as being seen as the one where they could beat them over a league season and bring back that elusive English title. Season 1985-86 was seen as a big season for Robson. He was looking to lead United to their 1st League title since 1967 and England to the World Cup Finals at the 1986 World Cup Finals in Mexico. Sadly it would turn out to be one of the most frustrating seasons of all for Robson. Although United won their 1st 10 league matches and were top for a large part of the season, their form deserted them and they finished a distant 4th in the League once again and were knocked out of both domestic Cup competitions (English clubs were banned from Europe from 1985 -1990 so only domestic matches). Robson suffered a really badly dislocated shoulder at an away game at West Ham in March which would require an operation and would put him out for the rest of the season and the world Cup. Bravely though, Robson decided to carry on playing, despite the pain. He made it to the World Cup, but in only the 2nd game of the tournament, his shoulder badly gave way and it was all over for him – he would have to return home immediately for the shoulder operation. A really disappointing end to a season that had promised so much for Robson. Season 1986-87 would mark a serious change for Robson and Manchester United. Ron Atkinson was now a man under pressure at United, following the club’s failure to win a league title, despite 2 great FA Cup wins. By November, following a shocking 4-1 League Cup defeat at Southampton and really poor league form too, the club ran out of patience with him and he was sacked. His replacement – Alex Ferguson- came in, as a manager with a strong reputation, with his hugely impressive record of what he’d achieved at Aberdeen. Looking back now, this proved to be the best possible managerial appointment that the club could have made. Robson would now have a club manager who would match his determination and will to win and both Robson and Ferguson recognised this in each other. However, it would take a number of years for this to be achieved – as Ferguson soon realised that there was a lot of re-building work to be done. Robson would play a key role in this rebuilding, as Ferguson saw him as his leader on the pitch. Season 1986-87 saw United finish in 11th place, having been in the relegation zone at times when Atkinson was still in charge. The following season the club finished 2nd behind Liverpool which was encouraging, but in 1988-89 it was a disappointing 11th. There were no decent domestic Cup runs either, so the pressure was on Ferguson in 1989, despite the great work he was doing behind the scenes at all levels of the club. At the time Robson’s form was really impressive, despite the problems that the club was having and he was avoiding big injuries thankfully. He was playing well for England too, despite some problems for the national team managed by Bobby Robson, as they lost all 3 matches at the 1988 European Championships. I remember him scoring a great goal away in Yugoslavia to help them qualify for the tournament and a great goal against Holland at the Championships too. At the time, a lot was said about the drinking culture at Manchester United – especially Robson, Paul McGrath and Norman Whiteside – something that was frustrating Ferguson. However I remember a brilliant match at Wembley in 1987-88 – Football League vs Rest of the World – to celebrate 100 years of the English Football League being formed in 1888. That day, against a team of the world’s best players – including Diego Maradona and Michel Platini – the 3 best performances were by United’s top drinking team – Robson, Whiteside and McGrath. Football League won 3-0, with 2 goals from Robson and 1 from Whiteside and McGrath was given man of the match. In the summer of 1989 though – to the great disappointment of many United fans, McGrath and Whiteside were sold by Ferguson. Although drinking was seen as playing a part – injury problems for them both must have been a big factor in this. Whiteside would end up retiring just over 2 years later, but McGrath, despite chronic knee problems would carry on at the top level for another 8 seasons, so it was mixed fortunes. Although Robson clearly liked a drink, it has to be said that he was normally under control of this, as he trained like mad and still put in great performances out on the pitch. Also, the majority of the drinking Robson did was with his team-mates and at these, Robson would spend a lot of time talking to them about the team and the roles they were playing. So, the drinking was seen as an important part of team spirit and discussing any issues they had over a few drinks. Drinking by footballers wasn’t exclusive to United though – it was the culture in the game at the time, as Arsenal players like Tony Adams and Paul Merson have since revealed. With Manchester United, whatever goes on at the club always generates the most news and that’s why the drinking was picked up on more, I’d say. Season 1989-90 would be the make or break season for Ferguson, especially with the money he’d been given for new signings – Pallister, Ince, Wallace, Phelan and Webb. Their League form struggled all season, in particular being remembered for a shocking 5-1 defeat away at Man City. The FA Cup run though was encouraging, as United had one of their most memorable FA Cup runs ever – being drawn away from home in every round. Robson missed the earlier rounds but was back for the semi-final, scoring in this match and playing an important role in the Semi-Final replay against Oldham too, as United reached their 1st final under Ferguson. Although United finish a really poor 13th in the League, they went on to beat Crystal Palace in a tense FA Cup final replay 1-0, after being held to a 3-3 draw in the 1st match. The fighting spirit shown in the FA Cup showed what Ferguson’s team were capable and showed real encouragement to fans and club officials too, with confidence being increased in Ferguson again. There was more frustration at international level for Robson though – he went to the Italia 90 World Cup as England Captain, but again returned home injured after only playing in the opening 2 matches of the tournament. Robson would only play a handful more times for England, as Bobby Robson left after the World Cup, being replaced by Graham Taylor. Season 1990-91 marked further improvement for United – as they finished an improved 6th in the League and reached the League Cup Final, but it was their European Cup Winner’s Cup campaign which the season is best remembered for. Following a 5 year ban, English clubs were allowed back into Europe again and it was to be a huge success for United. Robson did not play for United until December that year, as a result of his World Cup injury, but once he was back he played a great role as always for the club. He was also rewarded with an extremely well deserved testimonial against Celtic that season. United beat Pecsi Munkas and Wrexham in the early rounds of the Cup Winner’s Cup, followed by impressive away wins at Montpellier and Legia Warsaw, which meant United were in the final against Barcelona. This final was an amazing match and an amazing atmosphere as United beat Barcelona, to lift the European Cup Winners’ Cup. United under Ferguson’s management were getting stronger and stronger. Season 1991-92 would be one of ultimate frustration for United. Following some great Cup wins – the European Super Cup and the League Cup were added in this season, the number one target would be the league title. despite being in the lead for a long time, United missed out on the title to hated rivals Leeds United. 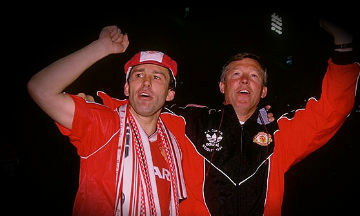 That elusive title still seemed a way off for United fans, Ferguson and Robson in 1992. Season 1992-93 marked a huge change in English football with the introduction of the FA Premier League, replacing the old First Division. It also marked a big change in United’s fortunes in the league, especially following the signing of Eric Cantona in November 1992, which resulted in United winning the inaugural Premier League title and their first League title since 1993. If there was any United player that deserved that League title win, it was Robson for the way that he’d led the team so strongly since he joined in 1981. This was the 1st season that Robson was not an automatic starter in the team, as he was used more as a substitute by Ferguson, especially as Robson had a few injury problems again. Robson was still an important squad player and played his part in the club reclaiming that elusive title that season. Season 1993-94 was Robson’s final season at United. It also marked the crossover season between Robson and his successor in the centre of midfield – Roy Keane. There had long been a big concern about who would replace Robson when he left and the club had found the perfect player in Roy Keane, who would run United’s midfield for the next 12 years. It meant United had the best midfield leader in the country and Europe for a quarter of a century. Robson saw the huge potential in Keane and has mentioned this in interviews since as well. That season was an important one for Keane too, as he also had the benefit of learning from a true legend in Bryan Robson. They also spent plenty of time together away from the pitch, having drinks together and talking about the game. Robson’s role for that season was again as a squad player at United but he again played an important role and earned a second, fully deserved, League Title with the club. His final goal for the club would again be in an FA Cup Semi-Final, this time in a 4-1 replay victory over Oldham Athletic, that sent the club to Wembley again. It would be his 99th goal for the club. Robson made his final appearance for the club in the final home match against Coventry City, where United were presented with the Premier League trophy again. As with the previous season, it was Robson, the club captain and Bruce the team captain who would lift the trophy together. The lap of honour was special, as it finished with Robson standing in the middle of the pitch and receiving the loudest and most deserving ovation and cheers from the ground, who knew that he was leaving the club. This was to be the final farewell for Robson, as he was not named in the starting line up or even substitutes bench for the FA Cup Final against Chelsea the following weekend. Robson never complained about this decision though and accepted it like the true legend that he is. At the Cup Final itself, Robson, who was sat with the substitutes, manager and staff in his suit, still received a huge ovation from all of us United fans inside Wembley that day. After leaving United, Robson would embark on a new career in football as a manager, although he did carry on as player-manager for a few more seasons. The 1st club he managed was Middlesbrough and this was his most succesful time as a boss, as he twice led them to promotion to the Premier League, to 2 League Cup Finals and an FA Cup Final. From there he had spells managing Bradford City, West Bromwich Albion, Sheffield United and his current role of Thailand Coach. He was also assistant to England boss Terry Venables between 1994 and 1996, during which the England team reached the finals of the European Championships. In addition, he still works as an ambassador for Manchester United – a true football man. Not only was Robson a truly legendary player, he was also a great person too. I’ve been lucky to have met him a number of times and he has always been happy to chat, pose for pictures and sign autographs. He has always made himself accessible to football fans and this continues to this day with his ambassador role at the club too. The recent news about Robson’s cancer battle shocked myself and all football fans, but I know what a determined fighter he will be with this – a true inspiration to people – Captain Marvel. Legend profile written by Daniel Burdett.